Here at Occupy DC, we have been extremely fortunate in our good relations with the several police services that operate in our city. Our interactions with police have been generally cordial, and we have not felt threatened in any way. The police violence that our friends in Oakland - and many other cities - are suffering stands in stark contrast to our experience here in DC. 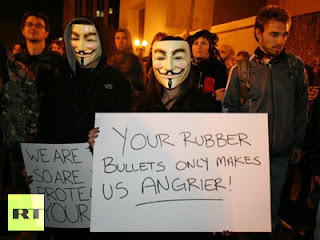 We occupiers are really good at the "truth" part. Most of us have highly developed analyses of the problems facing our country. We do a good job at pointing out what is wrong. But love is harder. Love requires us to lay down our own selfish interests and act for the sake of others. It means seeing the reality of God's love for others, even those who want to do us harm. Real love goes far beyond strategic nonviolence. When we are grounded in love, we seek the spiritual and physical wholeness of every person. Love empowers us to see the broken humanity of each individual, and to have mercy on each one for Jesus' sake. When we are living in both love and truth, we are able to stand firm in the face of violence without needing to retalitate. We recognize that the violent person is sick - alienated from the love of God - and that we are called to reach out to them with mercy. To be loving, however, does not require us to be naïve. We understand that the police - and, more importantly, the powers that give them orders - are not seeking our best interests. We understand that the powers are trembling, and that they are willing to do us harm in order to maintain their privilege. We have no illusions about the ultimate allegiance of the police. But we must love them. 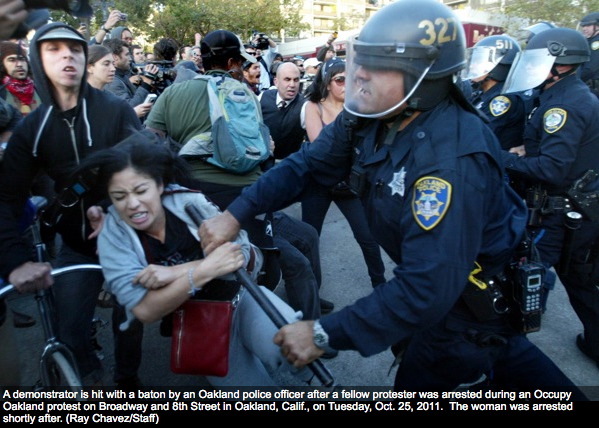 It has been pointed out that police are also part of the 99%. Far more important than this, police officers are also children of God. Just like us, they are in desperate need of God's mercy and love. I pray that rather than falling into the trap of fear and hate, we will imitate Jesus who prayed for those who crucified him: "Forgive them, Father, for they do not know what they are doing." Emergence recognizes that there is a problem; to emerge, we must emerge from something. As a member of a new Quaker church in the heart of Washington, DC, it is not hard to identify things that we are called to move out of: We witness daily humanity's greed and lust for power; we feel the pressure to lead accelerated, over-burdened lives; we are lured by materialism and spurred by ingratitude. We are beset on all sides by attitudes, situations and structures that we know to be contrary to God's intention, yet are unable to remedy through our own efforts. Playing an impromptu concert in McPherson Square is challenging. Jon had no amplification, and was forced to compete with the chaos of police sirens, traffic noise, a nearby drum circle and repeated "mic checked" announcements from other occupiers. It took Jon a while to navigate these obstacles, and the beginning of the set was really hard. By the end, though, Jon was able to capture the mood of the crowd and speak to their hearts in a really beautiful way. Through Jon's faithful musical witness, there were moments last night when I felt we began to discover the true Source of our unity. 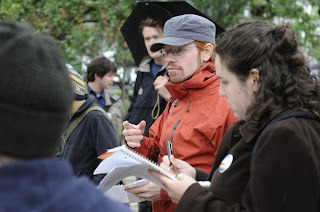 Jon's poetry came alive in a new way in McPherson Square. His art emerged from the theoretical confines of digital recording and was birthed into the living struggle for love and justice. Jon had never played for an audience like this one. He is used to playing in meetinghouses and at Quaker events, where he can count on his audience being quiet and attentive. 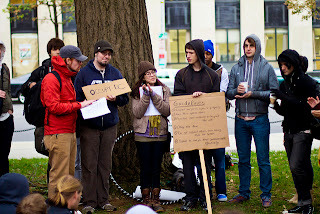 At Occupy DC, Jon had to fight hard for people's ears. The occupiers had to be convinced by the beauty of Jon's message. I am grateful for the ministry that Christ is doing through Jon's musical and poetic witness. I pray that the Lord will continue to bless this movement with beauty that blesses and calls us deeper into the transformation that God is asking of us. Since Pentecost, when Jesus sent the Holy Spirit to unite and guide us, we have been able to draw on the shared wisdom, faithfulness and experience of the Church - the community of faithful believers in the world. While no longer physically with us, Jesus is present in our midst. 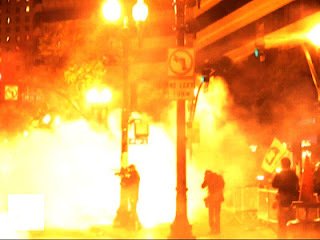 Weeks of intense involvement in Occupy DC have reminded me of my own need of his presence. Just as Jesus withdrew on a regular basis for prayer, I have been careful to make space for time alone with God. I seek to continously wait on the Holy Spirit to direct my steps throughout the day. But I know that I am not as strong as Jesus was. I need more than solitary prayer - I need the support of Christian community. The Occupation is a broad movement that brings together individuals from a wide variety of backgrounds, faiths and worldviews. The goals of the movement are couched in largely secular terms, and decisions are typically made based on human wisdom rather than a search for God's guidance. It would be easy to lose perspective in such an environment. I could easily start believing that I am in the streets to promote "democracy," demonize the rich, or oppose capitalism. In order to stay grounded in the Truth, I need help from the community of disciples here in DC. The Church and our witness need to be the primary reference point in my life. There are many Christians involved in Occupy DC - I discover more all the time. Nevertheless, the overall culture and worldview of the Occupy movement is a lowest-common-denominator, generally left-wing set of assumptions. 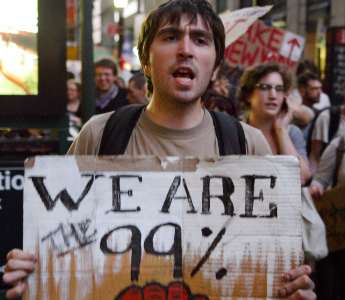 So far, almost all of the discourse at Occupy DC has been about "restoring democracy," "building power," or the plight of "the 99%." I have not heard anyone - including the folks whom I know are Christians - talking about the Kingdom of God and Jesus' mission to liberate the poor and oppressed. I pray that the Body of Christ might rise up - not only through the hidden faithfulness of thousands of individual Christians, but also through the explicit engagement of our local congregations and denominational bodies. I, and the countless other individual Christians who are already engaged in this movement need the support and guidance of the rest of the Body of Christ. Do we really want to know Jesus - intimately? Do we want to know him as he truly is? What if he does not affirm the way we are living? What if his love is a consuming fire, demanding radical change in the way we think, feel, and lead our lives? What if Jesus is nothing like we expected? What if instead of peace, he brings a sword - dismembering our comfortable, self-centered lives? Real relationship with God means surrender. Our spiritual ancestors knew this. That is why they always clamored for an intercessor, someone to stand between them and God. The Hebrews in the desert begged Moses to speak for them, rather than come face to face with the painful radiance of God's glory. Later, they demanded a human king to rule over them. We can deal with a man - just please, oh, please do not make us face the gaze of the Almighty! Do we honestly want to know the Lord? Do we want to meet Jesus' gaze and hear his voice? Are we ready for the loss of control; the life change he will demand of us; the mission he will charge us with? Will we allow Jesus to reveal himself as he truly is, not as we wish he were? When I first learned of the demonstrations on Wall Street, I did not take them very seriously. 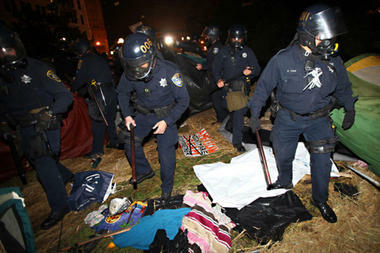 But I began to take notice when I heard they were occupying a park in lower Manhattan and planned to stay indefinitely. The mainstream media - and even the alternative press - was mostly ignoring the story, so I investigated on Twitter and independent blogs. The more I learned, the more fascinated I became. This, I thought, could really be a sign that America is waking up. For people of my generation, public dissent and activism had mostly been discredited. It was something that "hippies" and irrelevant leftists did - not people who wanted to be taken seriously. 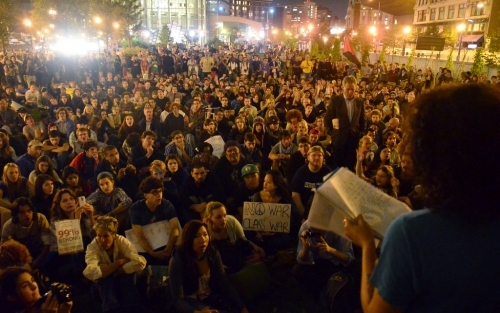 Occupy Wall Street, and the numerous local movements that are popping up all over the country are changing that. 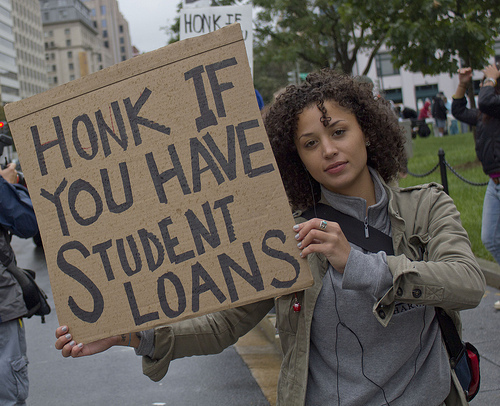 For the first time that I can remember, taking to the streets seems like a viable option. We can sense life there. As I learned more about what was happening in New York, I felt that I needed to be personally involved. I felt a sense - I believe it was a leading of God - to travel to New York and be a witness to events there. 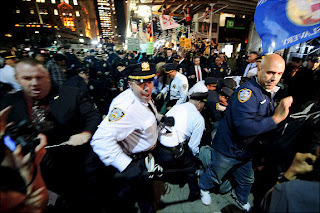 After seeing the situation in Manhattan, I was very impressed by Occupy Wall Street. Although I still had many concerns about the particulars of the movement, I felt that I needed to stay involved. When I returned to Washington, I linked up online with some other DC-area folks who also felt the need to participate. Over the course of a few days, we gathered in an online chat room and discussed how we wanted to move forward on starting an occupation here in our hometown. We picked a start date - October 1st - and a location - McPherson Square. The night before we began, seven of us met together in person for the first time to iron out the details of the occupation's first hours. 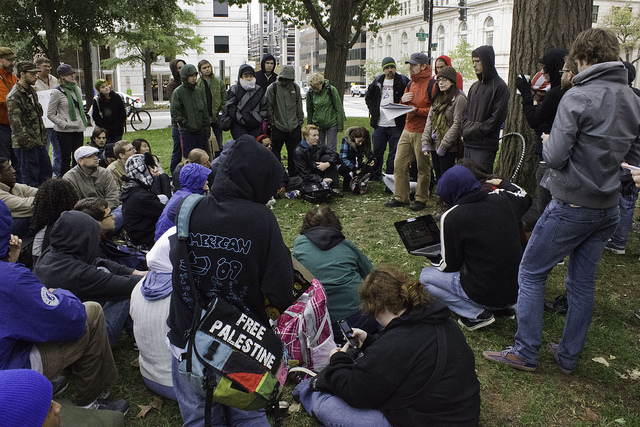 The occupation on K Street - home to a wide spectrum of monied interests and their lobbyists - has since grown to an occupation of hundreds of people. We now have an established media center, complete with an electrical generator; a welcome station; a food center with a makeshift kitchen; places for folks to sleep; and a regular gathering of the whole group for our business meeting, called the "General Assembly." We are growing in numbers and in organization. We are learning how to organize ourselves as a movement. 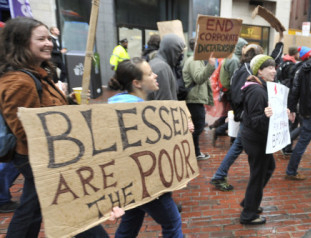 My reasons for being at Occupy DC are rooted in my faith in Jesus Christ. It is his proclamation of good news to the poor, release to the captives and sight to the blind, that calls me into this struggle for greater compassion and justice in this city, nation and planet. (2) It is his voice in my heart that calls me to stand with all of those who are standing up now for a more just and compassionate society. It is my prayer that Occupy DC will continue to develop as a movement that calls our nation to deeper love and responsibility, accepting Jesus' invitation to lay down privilege for the sake of those who are marginalized and silenced. As I continue to be involved in this ongoing public conversation, I ask for your prayers. Please pray that God will guide and ground me in Christ's tenderness and truth. Let me be a witness to his perfect love that casts out all fear. Please pray for all of those who are putting their bodies on the line to help us wake up to the condition of our nation. May we find the way forward together, bonded in the peace that comes from singleness of vision and submission to God's will. 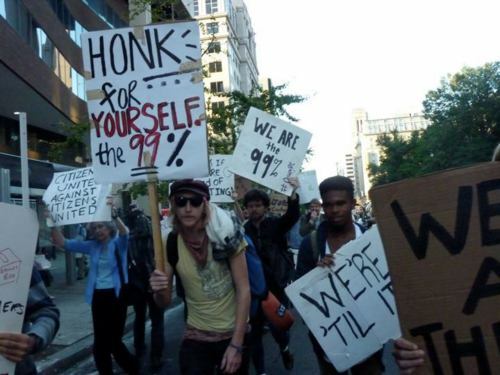 One of the most remarkable aspects of the Occupy Wall Street movement has been its use of consensus decision-making as the basis for a "leaderless" activist community. In New York and elsewhere, the movement employs a complex process - including hand gestures, procedural rules and a whole constellation of facilitators, each charged with a particular task. 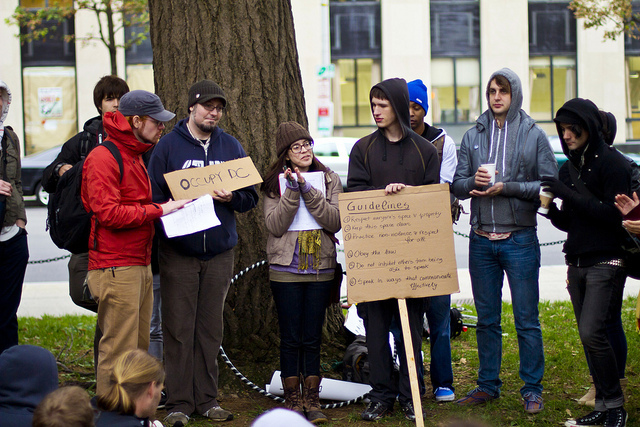 In the first days of Occupy DC, we employed a different model - a slightly modified version of Quaker decision-making. Compared to the complex process employed in New York, the Quaker-derived model was streamlined, involving only a single facilitator and her assistants. The facilitator helped gather the agenda, called on individuals who wanted to speak, and generally kept us on track. In the New York process, decisions are routinely made with individuals "standing aside" from the decision. It is possible for an individual to block a decision, but blocking is only allowed in cases of a serious moral objection. To block a decision is to say, "if you do this, I must leave the group." This sets a very high bar on dissent, and all but the most strident of individuals quickly learn to save their objections for the most extreme cases. As I have seen in the last few days, this results in decisions that leave much of the community feeling disempowered and silenced. With the criterion for blocking a decision set so high, a small group of charismatic individuals can easily sway the group to make decisions that many - even most - do not consider optimal. No one wants to be the dissenter that holds the group back. In this context, "consensus" is a decision that no one in the group is willing to oppose outright by blocking. In this process - so different from New York-style consensus - success is measured by the depth of unity in the group. We know that we have reached a solid conclusion when there is a deep sense of peace and settledness in the body regarding the decision we arrive at. It is not enough to assent to a decision that represents the lowest common denominator. When we listen together with patience, gentleness and receptivity, we are brought into a unity that goes far beyond consensus. We seek nothing less than the truth for the group at that time. 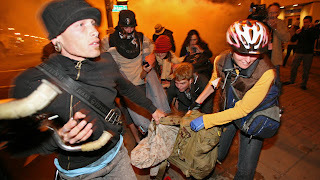 I have been working almost non-stop this week, helping to get Occupy DC off the ground. I have carried signs; distributed fliers; marched on Bank of America, ALEC, Citibank and Koch Industries; helped facilitate group decision-making; and trained new facilitators. The Occupy Wall Street movement is growing in dozens of cities across the country (including my hometown of Wichita, Kansas), and there is a great deal of work to be done. I am working alongside some really amazing people, most of whom I had never met before. These women and men are fed up with the overwhelming influence of the wealthy elite and their corporations, and they are gathering to tell the super-rich 1% that we - the 99% - will not remain silent. This work is hard! I have been pulling twelve hour shifts out at McPherson Square, and after just a few days I realize that I am already on the edge of burning out. There is so much work to be done and so many people to talk to. I simply cannot be present to everything and everyone all at once and all the time. I reflect often on the fact that Jesus took regular breaks from the crowds and retreated to pray. He sought wisdom and guidance from his Father. Carving out times of solitude, he took time away from the press of the multitude. Jesus knew very well that the crowds would never be satisfied, no matter how much of himself he gave. Rather than trying to satisfy the crowds, Jesus focused on giving them just what his Father had sent him to deliver - no more, no less. Jesus did not allow pressure from the masses to derail his teaching, healing or the training of his disciples. Above all, he did not permit the demands of the throng to interfere with his relationship with the Father. Prayer was at the heart of everything Jesus did. The harder things got, the more fervently he prayed. As Occupy DC continues, I cling to Jesus as my example for how to relate to God and people. Prayer must be the ground and center of everything I do. Without the peace and stability of the Holy Spirit, I cannot withstand the press of the crowd. Without the strength that God provides, the demands of the people will consume me. I must remember that my job is not to direct this movement. My role is not to make things turn out the way that I would like them to be. Instead, my calling is to embody the love of the Lord Jesus, radiating his joy and peace to everyone I meet. This seems impossible, but as the Lord himself said, "what is impossible for people is possible for God" (Luke 18:27). 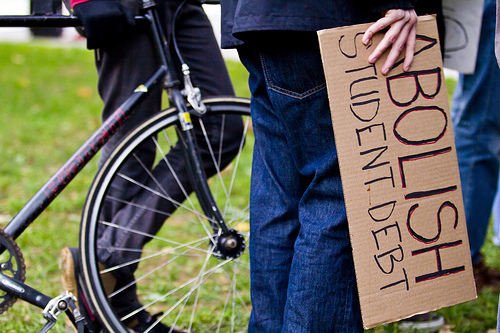 This growing movement demonstrates that many of us are rejecting the distorted worldview of consumerism and Mammon. As a disciple of Jesus, I believe that there is a better way of living, one that lays down privilege instead of grasping it; showing willingness to suffer rather than inflict suffering. With God's help, I pray that my life and example will proclaim this Good News in these days of unsettledness and seeking. How are we, as disciples of Jesus Christ, leading lives that point to the peace, justice and joy that come from unreserved surrender to God and his love for women and men? How can we stand with the world in its suffering, while calling others to know the Great Physician who can bring true healing? What would it look like for the Church to be fully engaged in the struggle for truth and mercy in our land?